Admittedly, it looks kind of like a torture device. But I assure you, this thing is a life saver. The lowest cross bar keeps her knees from buckling. The hip strap holds her mid-section secure. The back support prevents her from arching and hurting herself. Socially and emotionally, it's also awesome for Elsa to be up at eye level with her peers. In this time hop back to 2015, my middle daughter weasels her way in to steal Elsa's toy. Sisters. This summer, we starting bracing Elsa's legs at night to keep them in extension. We do this so that Elsa doesn't spend an additional 12 hours each day with her knees bent - this can make her legs really tight. Elsa also started looking really good in standing. I just love this pic. Our girl also grew a ton. She's a giant by Wolf-Hirschhorn Syndrome standards - off the charts. On a standard growth chart, she's in the 15th percentile. (I'm very happy with this!) 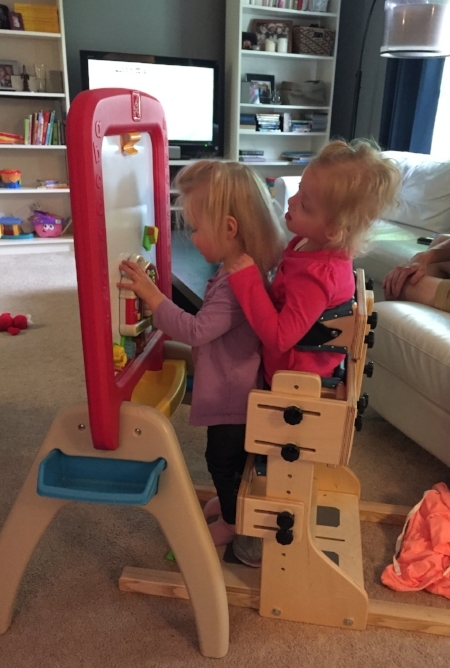 Due to this tremendous growth, she has finally outgrown her stander. It's with great joy that later this week we'll be giving it to our sweet friend Olivia - another little gal with WHS, who happens to live just a few miles from our home. Olivia's momma is my dear friend Hillary. You may remember Hillary's awesome back exercises, which I featured earlier this year. Since Elsa has outgrown the stander (it's started to give her little bruises from the squeezy fit of it), we have started using our gait trainer more. The problem with this device is that Elsa tends to "cheat" in it - hanging like Superman in the bottom harness. This weekend we decided to use the gait trainer a little differently. We took the bottom harness off completely - so that she had to literally stand on her own two feet, without support - and lowered the device so she could lean her bottom against it. The result = HUGE SUCCESS. She worked so hard and stayed up for almost 30 minutes at a time! We have a long way to go to attain independent standing. But we're excited for what this might mean for the future. 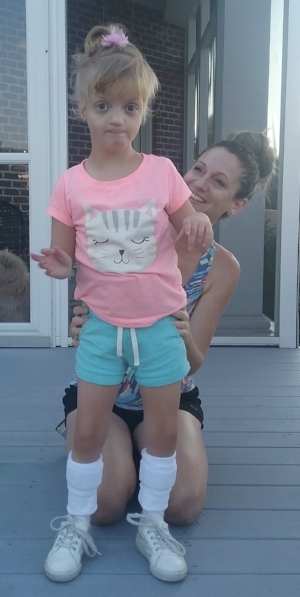 Instead of standing with knees locked, her body is now constantly making tiny adjustments to maintain stability. It feels like a big step forward. Pun absolutely intended.